Layla as a company was founded by two Silicon Valley brothers well-versed in the art of mattress making. As is expected the mattress pack a huge list of design features that Layla claim has a greater tendency of improving the quality of your sleep than their rival brands. Prominent amongst such tech is the copper infused memory foam and dual firmness levels bundled in one mattress. The dual firmness incorporated in one mattress is the first of its kind in the mattress industry, so naturally, it scored huge PR points for Layla. Going a step further in the quest to develop a genuinely cool sleeping mattress Layla have opted to ditch the trendy gel memory foams for a more pragmatic copper infused memory foam, as the solution for memory foam penchant to heat retention. 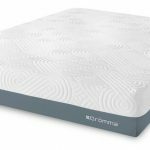 Whether this two potentially game-changing innovations translate to a pleasant sleeping experience (which is all we care for regardless of how it is achieved) is what we at mattress guides intend to find out with this review. Featuring a minimalist construction, From top to bottom, the mattress is made up of a single layer of convoluted base foam sandwiched between two layers of copper infused memory foam that stacks up to form a pushily thick 10-inch mattress. The mattress cover is crafted from a blend of fabrics with an added layer of gel in a configuration Layla terms as THERMOgel. Instead of infusing the gel in the memory foam (as is commonplace in the industry) the company has opted to fuse the gel with the part of the mattress that comes in direct contact with your body, the cover. The first layer is a 3 inch thick softer version of the copper infused memory foam which the mattress hosts. Copper infusion means this layer has a higher propensity to dispense accumulated heat than traditional memory foams. The second and middle layer is a 6-inch convoluted base foam layer designed to accord support, structure, and form to the mattress as a whole. Spotting a highly dense polyfoam build the layer acts to resist mattress deformation over time while maintaining the overall structural integrity of the mattress. The final layer is 1-inch memory foam similar in construction to the first layer. That means it is made up of copper infused memory foam layer only this time it is thinner and firmer. This layer is what gives the Layla mattress its versatility; as customers can opt to switch the mattress over so that this becomes the first layer to get a firmer mattress. For a three layered mattress the Layla foam packs pretty impressive levels of bounce and responsiveness. Though not the best out there in terms of bounce considering its price point it certainly is satisfactory when it comes to bounce and responsiveness. 6 inch of base foam means that this mattress is highly capable of providing support to any sleeper category. In conjunction with the memory foam layer, the foundational layer affords the Layla mattress optimal comfort and durability. From our analysis, the soft side of the Layla mattress comes in at 3.5 in our firmness scale(0-10) where one is overly soft, and ten is rock hard. What this means is that this side up of the mattress would be particularly suitable for lightweight and side sleepers. The firm side, on the other hand, ranks 7 in our firmness scale(0-10) . The high level of firmness is to be expected considering the relatively thin memory foam layer that separates the sleeper from the base mattress. For sleepers who display prefer a mattress with almost null hug levels, the firm side is a perfect fit. On the front of comfort and luxury, consequent of the incorporation of a high-quality memory foam, the Layla mattress does an excellent job of providing a truly satisfactory sleeping experience. The memory foam contours effectively around the body of the sleeper while providing pressure relief. That said the soft side demonstrated considerable amounts of sinkage, and for individuals who prefer a bouncy mattress, this might be an issue. The firm aspect of the mattress is bereft of any of such sinkage. Both sides display optimal levels of support, guaranteeing the leverage of even the most plus sized of sleepers. The Layla design team obviously did their homework with regards to motion transfer. Considering the minimalistic design of only three layers, motion transfer on this mattress is almost no existent; the mattress performs impeccably well in isolating and curtailing all forms of movement and vibrations to their source of origin. For sleepers who intend to share the mattress with a partner, this is an especially important feature as it absolves the consequence of one partner sleeping habit to have an effect on the sleeping regimen of the other. Apart from the ingenious dual firmness level, the Layla mattress also has another ace up its sleeve. Covering the constituent foam layers of the mattress is the THERMOgel cover. According to Layla once this cover comes in contact with body sweat it activates a cooling mechanism that acts in synergy with the copper infused memory foam to ensure proper heat dispersion and in extension a cooler mattress. Faithful to this the mattress does incredibly well in the cool sleeping department. The Layla mattress starts at a competitive price point of $499 for its twin size. Considering the quality of materials and its lifetime warranty (which we will talk about in a bit) the pricing structure of the Layla mattress is almost too cheap. Very few mattress brands deliver this level of quality and still start below $700. If this low price ceiling is something you cannot afford at a blow, Layla got you covered as they also have a spread out financing option that allows you to pay for your mattress over a stipulated period. Like most Bed in Box companies, Layla operates an online purchase and delivery system bereft of intermediaries and phony sales personnel. In so doing they (Layla) have effectively cut out the additional costs that are often attributed to the presence of these middlemen in the distribution chain. Once purchased, the mattress ships out in two to three days via FedEx and takes not more seven working days to get to deliver to the customer. The mattress comes sealed and compressed in a box; after unpacking it usually, expands to its actual size in a matter of minutes. To make up for the lack of brand showrooms (though the mattress is available at Nest Bedding Showrooms) and further protect the interest of its customers Layla offer a 120 nights trial period, during which customers can return the Layla mattress for a complete refund if it fails to live up to expectations. Layla offers a lifetime warranty coverage for the mattress. Again for the price structure of this mattress, this surpasses all our expectations. In all the mattresses we’ve reviewed so far, only one other brand has the option of a lifetime warranty, and yes you guessed right it is priced significantly higher than the Layla mattress. The fact that Layla has opted for this lifetime warranty goes a long way to demonstrate the confidence they have in the durability of this mattress. Layla will replace or repair (much like other brands) any defect or damage resultant from poor craftsmanship or manufacturer negligence. Relatively new, but making giant strides is a phrase that perfectly sums up Layla as a brand. For that, they score a solid B in our company reputation charts. Given their current pace, it would be no surprise to us if they become one of the more dominant mattress brands in the United States. Layla actively participates in charity and philanthropy. Apart from their periodic contributions to select charity organizations, Layla has a company policy of according one homeless person a pleasant night rest for every mattress sold. The Layla mattress utilizes high-quality materials in its construction. From the copper infused memory foam, to the THERMOgel layer; all are design features that if incorporated in some competitor brands will shoot their starting price to over $1000. The Layla mattress line-up however still manages to stay under $1000 for all sizes. The Layla mattress features a one side soft and one side firm configuration, allowing you to quickly change the firmness level of the mattress by simply flipping it. So, if the soft side doesn’t work for you, you can quickly flip to the other side. What’s more, if that still doesn’t meet your sleeping needs you can also request for a full refund. Very few mattresses offer this level of flexibility. These days the tag ‘sleeps cool’ seems to apply to virtually all brands of mattresses. However, from experience, very few of them have delivered on that promise. The Layla mattress is one of the select few that keep to the promise of sleeping cool, all thanks to the THERMOgel and copper infused memory foam. For its price tag, the Layla mattress does an outstanding job of delivering a nice and pleasant sleeping experience. Very few mattresses in this price range come close to affording the level of comfort and luxury provided by the Layla mattress.